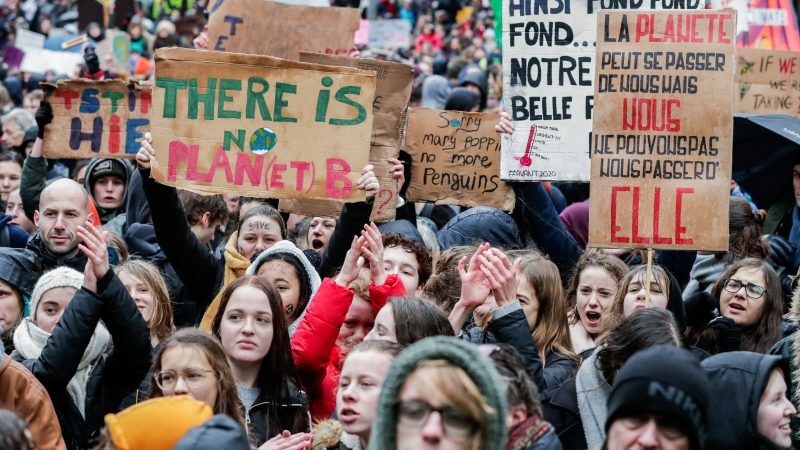 Brussels has witnessed two sets of major demonstrations in recent weeks – those by students concerned with climate change and those by people attracted to populist solutions to austerity. Completely contrasting in both style and substance, the two sets of protests are seemingly unconnected, writes Luc Triangle. Luc Triangle is the general secretary of industriALL Europe. But a political clash between the champions of the environment and the losers of economic change could come to dominate the close future without a just transition to a new green economy. IndustriAll Europe stands with citizens demanding a move towards a sustainable, low carbon economy for the good of our planet. We also recognise the source of the anger that is firing populist movements across Europe –rapid, unmanaged de-industrialisation that sparked unemployment, poverty and social decay. There is no avoiding the fact that climate change requires another industrial revolution, but we can avoid millions of working people once again being made to pay for the mistakes of the past. That is why we are using this year’s EU Industry Day’s to bring together unions, employers and politicians to discuss the employment and social aspects of decarbonisation. Europe’s energy intensive industries support employment for 6.6 million people, most of those the kind of semi-skilled workers who have so regularly lost out in recent decades. Losing these industries and jobs would leave the European economy completely polarised between poorly paid, low-skilled jobs and highly-paid graduate positions and exacerbate Europe’s political problems by pushing more working-class people towards populists. These industries provide the materials for producing solar panels, windmills, electric vehicles and have played a positive role in meeting the European climate objectives by reducing emissions by 36% since 1990. It would be deeply ironic and self-defeating if these materials for renewable products end up being supplied by energy-intensive from non-EU countries with lower environmental standards. However, IndustriAll Europe believes manufacturing industries can be central to delivering the low-carbon economy with the right investment and new employment opportunities created. A myriad of low carbon technologies that could be applied in Europe already exist and further improvements to energy efficiency are possible, although zero-carbon technologies will entail huge investment that won’t immediately add value for the customer. That will require an integrated EU climate and industry policy that delivers more public funding for research and development – and the costs of integrating new technology in existing production systems. Access to finance with long-term payback periods should also be guaranteed as the private investments needed are very risk- and capital-intensive. Decarbonisation will see a sharp increase in electricity consumption by industry as fossil fuels are phased out, requiring huge investments in renewable infrastructure to guarantee reliable and affordable electricity. While many new jobs can be created in the low carbon economy, it’s true that some existing jobs will disappear while others will require different skillsets or be based in different locations. Employers need to constantly help upskill their workforce to be ready for these new challenges, while income security should be guaranteed for those who have to leave a company. New job opportunities need to be created in the circular economy connected to the energy-intensive industries, while redevelopment plans should be drawn up for regions where rapid change is expected to take place. Trade unions can help to achieve this just transition and avoid further social fragmentation through social dialogue at all levels – company, regional, national and European. The Paris Agreement includes a commitment to the ‘imperative of just transition’, but so far only lip service has been paid to this principle. We at IndustriAll Europe don’t think we can or even wish we could escape the changes that need to be made to tackle climate change, but there is no excuse to be unprepared for the consequences.